While the terms ‘information literacy’ and ‘media literacy’ make distinctive reference to the discourse communities in which they arose, the term ‘digital literacy’ is the child of many fathers. So it means a lot of different things to different people. 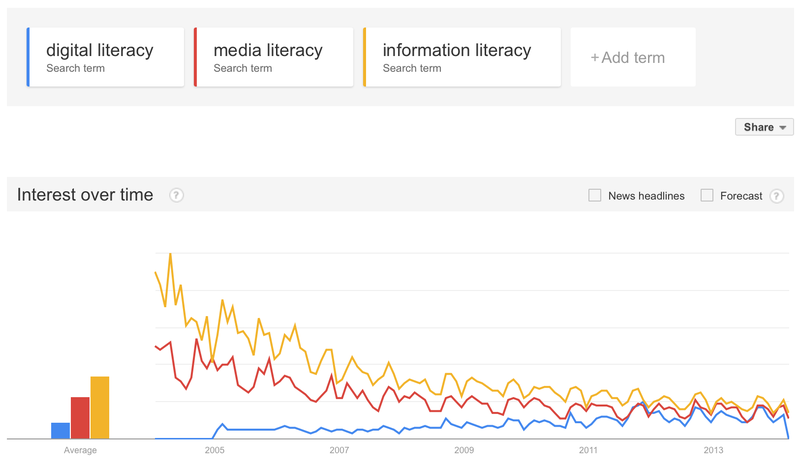 So I wonder: should the terms ‘information literacy,’ ‘media literacy’ and ‘digital literacy’ compete or cooperate? Should these terms hold on to their distinctive identities or is it a good thing for them to blur together? Friends, weigh in on this one for me: How do you predict these trend lines to play forward, in 2014 and beyond? This is such an interesting set of questions, and while I’m slightly unsurprised about the absent mention of “media literacy” in Jones and Hafner’s book, I’m still disappointed and concerned about it. I think the three areas can and should have their own distinctive identities/definitions, but that there must also be some foundational recognition of how the three areas are related. It’s important for historical context and it’s a crucial part of building up/strengthening the field of ‘expanding’ [New, media, digital, information, etc.] literacies as a rigorous, competitive area of research and literature. Interesting question, Renee and VERY interesting also to see a graphical representation of how the terms are trending. I’ve been struggling with the same questions, as an instructor of an info lit course at the undergrad level, an “English Methods” instructor at the B.Ed. level and a “digital literacies” instructor at the grad level. I’ve been using the term critical digital literacies to try to better define the research work I do — however it plays out, providing a definition of how we are using the terms is becoming increasingly important. Thanks for starting off our dialogue with an observation that leads to another question: Is the plural form of these terms a better way to capture the interrelationships between the concepts and social practices? Why or why not? I don’t think its productive, or really possible for these terms to “compete.” As we work to help unify and define the field, drawing lines between these terms seems to me a reductive idea: valuable in the context of direct research but harmful in the context of what all these “literacy” driven discourses are aiming to do. I think “news” literacy in some sense has suffered this fate, but trying to reinvent the wheel, instead of building from a rich and diverse history of work in literacy writ large. I say we are cognizant of the different spheres and disciplines that each literacy builds from but do not try to compete to the point of redundancy and stagnation. In that, the purpose of media (in whatever form) is to communicate; and what you are seeking to communicate (in whatever fashion) is information (of whatever type); and that digital platforms are ( at their most basic) simply another format for communicating information (insert a moment to inhale), why not communications literacy (which (I believe) they are all aspects of)? I like Brien’s comment above. Each title given to a “form” of literacy seems to be just another part of the beast that makes up communication in the form of symbols, signifiers, and codes. Like the tale of the blind men feeling the elephant it seems that there should be a more broadly used umbrella term for the thing that all these “new” literacies share (New Literacy?). Obviously this wouldn’t be the full answer however, since broadening the definition would force important details and difference of these literacies out of consciousness. Thanks for sharing – this is a great example of the new types of interdisciplinary discourse communities emerging now. Love the term “metaliteracy” as it promotes the kind of reflective thinking that I think is so essential to developing habits of mind needed for effective communication and learning. There are some downsides to new names, however. One problem is that they may make it difficult to track the trajectory of intellectual history or see how ideas, pedagogies and instructional practices evolve, change or remain consistent over time. I am in a ‘New Literacies’ course now and I am so frustrated by the fact that media literacy is not acknowledged within the curriculum. We have read texts covering: ‘new literacies,’ ‘New Literacy Studies,’ ‘multimodality,’ and ‘multiliteracies’ (to add a few more to your list). While I acknowledge that the theoretical frameworks and affordances of each term contribute to a larger body of knowledge worth reflecting on today, I am also experiencing how the use of particular terms neglects other perspectives, backgrounds and resources that are crucial for more interdisciplinary and widespread progress. If I recall a number of conversations in the 90’s when we were struggling to clarify what “media literacy” was — we tried to explain it as “information literacy,” or “visual/print literacy,” or “news literacy” or whatever, we decided that we would call the field “media literacy” until the term “literacy” was understood widely to mean competency in “reading” and “writing” messages in whatever format. I also like the term “medialiteracy” and suggest that it might be the evolutionary survivor to all prior terms. Going forward, “medialiteracy” would indicate current and future understandings while “media literacy” would indicate prior understandings of the field.